Note: Go elsewhere on this site for an e-book guide for owners of Android phones. Windows phones, not just Androids, are popular at St. Columba’s. 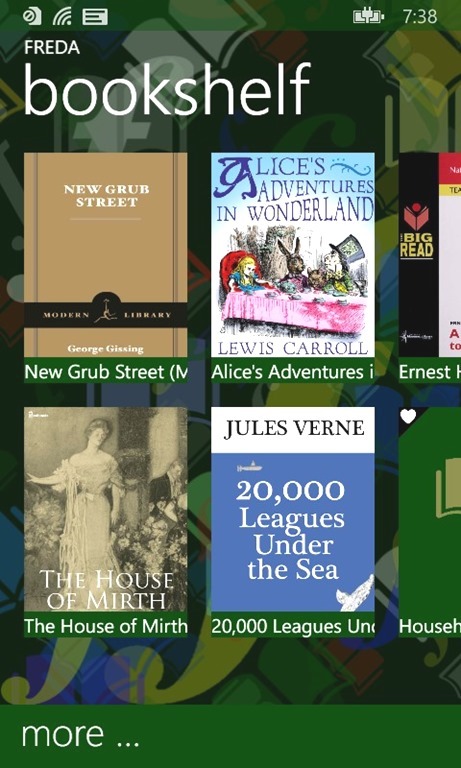 And a free e-reading app called Freda should almost surely work on your Windows phone—whether you’re using Windows 7 or Windows 8. This overview is about the Windows 8 version. A page for 7 will come later, although you should find plenty of clues here already..
With Freda you can download thousands of free ePub-format books from sites such as Project Gutenberg and Feedbooks and the Internet Archive. You can also enjoy ePub books from bookstores as long as the books are not sold with digital rights management (DRM). Also, Freda has many typographic options to help books look the way you want. And newer versions, at least, even can read books to you. You can find detailed descriptions of Freda’s features at the Windows store site and also the Freda site itself. Please note that not all the features for Windows phone 8 and 8.1 will necessarily work in the older phones. Freda also has a low-cost paid version, available at the Windows Store, to remove ads. 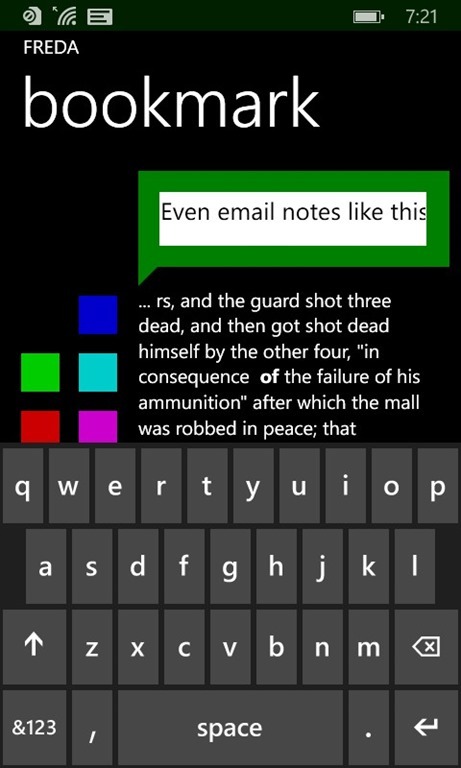 To obtain the program, just click on the Windows Store icon on your phone and then type Freda into the searcher. Then hit the Return key. Questions? Problems? Contact our tech guy and tell him what make and model of Windows phone you’re using, as well as the operating system in use if you know it. Your questions will help us optimize the tech tips in this blog for the St. Columba’s Cell Phone Book Club. Also, you can reach the Freda people directly. But before you e-mail anyone, why not see if the information is in Freda’s manual (written for the latest versions, although it may still be useful for earlier ones)? It even tells how you can use Freda with DropBox, a way of wirelessly transferring e-books and other files from your desktop to your phone or tablet. Use the Search box to find what you’re look for within the manual. –Calling up a “test” book already in Freda’s library on your device. Just reach it from the screen Freda starts up in. Tap on the image of the book cover, then if need be on the open book-style. –Moving ahead or back a page. Tap right or left on your screen. –Searching for words. Press the middle of your screen and a new screen will pop up a magnifying glass. It’ll lead to a Find page. 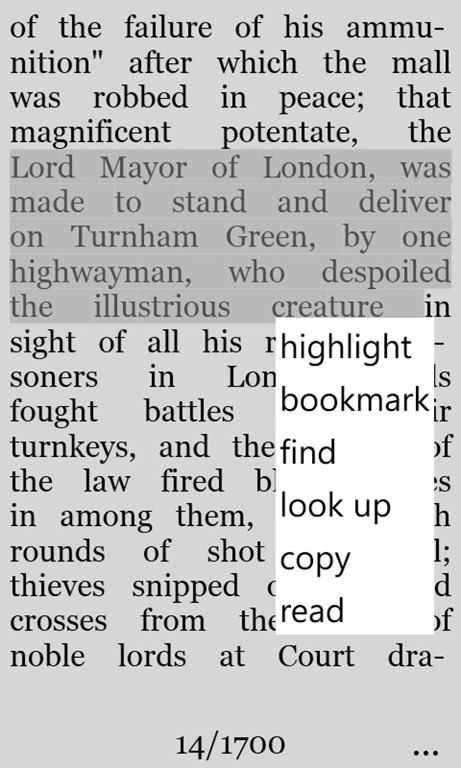 Use the left arrow in the lower left on your device to return to the text you were reading. –Adding bookmarks. Press the bookmark-like icon on the pop up screen. –Putting in notes and highlights–which you can e-mail to yourself or friends. Slide over the words you want to highlight,and you’ll see a menu that lets you choose between those options and others. –Using Freda to download books from sources such as Project Gutenberg and Feedbooks (free and commercial) and stores such as Smashwords. It’ll be pretty evident from the opening screen. –Changing colors on the page. The gray background in the screenshot above might be easier on some people’s eyes than plain white. But white it can be as well. Same for white letters against a dark background. –Calling up text to speech. Psst! We’ll spill the beans now. Just act as if you’re selecting text to be highlighted. But instead of highlighting chose Read when the options pop up. Freda will start reading until you tap again to shut up the voice. The path to that command from Freda’s main screen is Extras > Settings > Advanced (reachable by sliding your finger to the left, past one other option). Move around the main screen, too, by sliding. Go down 43 or so options within Advanced—count ’em!—and you’ll see “read aloud under locked screen.” Switch it on! Alas, “read aloud under locked screen” and perhaps even the voice feature itself are not available except in the most recent versions of Freda. But if you do have voice, you can still avoid interruptions by sliding your fingers down from the top of the main screen of your phone until you see All Settings. Choose a long time-out. Or none if you prefer. Of course, if you read the Freda manual and use the search box, you can conquer this app on your own. Detail #1: You can also download ePub books from within Internet Explorer if you’re at a site like Gutenberg. Just click on an ePub link and your phone will ask if you want to use Freda to read the file. By the way, although Freda works in other formats, ePub is the preferable one since it’s the e-book industry’s global standard. Detail #2: The video says you can’t “sideload” books for the Windows Kindle app—titles from non-Amazon sources. But you can e-mail books in appropriate formats to the Kindle app. Still, Freda makes it a lot easier to load up your phone with freebies from Gutenberg-style sites, and it offers more typographical choices than Kindle apos and devices do. Detail #3: If you’re female, don’t be put off by the “Hey, guys!” opening at the start of the video. E-books are for girls and women, too! We hope that cell phone book clubs like ours can help open up technology to women.